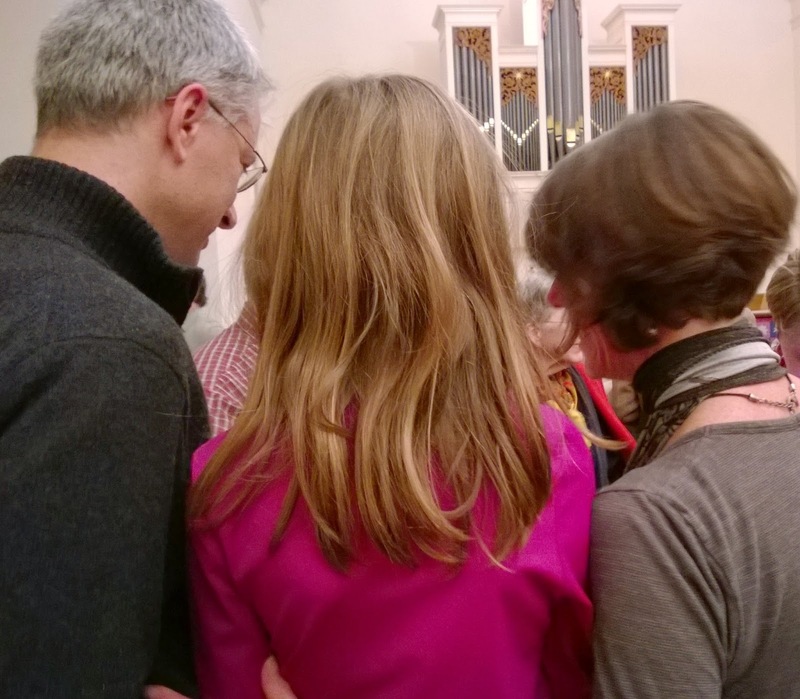 Worshiping with a child is a team sport, i.e. something you do together. And, like all sports having a collection of strategies and tricks to pull out as you play makes worship more interesting, fun and satisfying for all the players – including the parent/coach. So, here is a list of strategies with which even not-very-musical parents can draw children into singing with their congregation. It is far from complete. Add strategies that have worked for you in the Comments section. - In the child’s worship bag, provide bookmarks with which a child can find and mark the hymns you will sing. - Insist they sing with the congregation. Pull them away from anything else they are working on during worship, if needed. - Position their heads so they can hear and feel their voices in the middle of the singing. Younger children enjoy standing on the pew, being as tall everyone else, and singing in the middle of the music rather than hearing it somewhere above them. When children get too tall to stand on the pew, sit beside your standing child or simply scrunch over so that your voice is near your child’s ear. - Don’t sing all the time. Occasionally, hum or la-la, even whistle a hymn together. (Yes, in the sanctuary!) This is especially welcome by early or non-readers. They can participate and begin learning the tunes without the words. - As they begin to read, use a paper on its side or your finger to help children follow the words. They will brush you aside when they are ready to keep up on their own. - Emphasize repeated phrases or choruses in a hymn with a nudge and wink encouraging young readers to sing at least those phrases even before they can read all the verses. - Invest in a hymnal to keep in a worship bag. With your child underline important words. Write the date of each time you sing each hymn. Add star stickers or dog ear the ones you really like. Encourage your child to make notes or draw illustrations in the margins. Add some of your own. - Write a key phrase in a hymn you just sang on a piece of paper or a page in a worship journal. Urge your child to illustrate or write about it during rest of worship. Make your own page or add a note or drawing to your child’s page. There are CDs you can buy to play at home that have children singing popular hymns in a key that is comfortable for little voices. Also, you can sing hymns around the house as you do chores or drive. Familiarity makes it fun to hear in church and they get excited when they know one. I really appreciate you and this web-site. Robbie Castleman, author of Parenting in the Pew (IVPress).